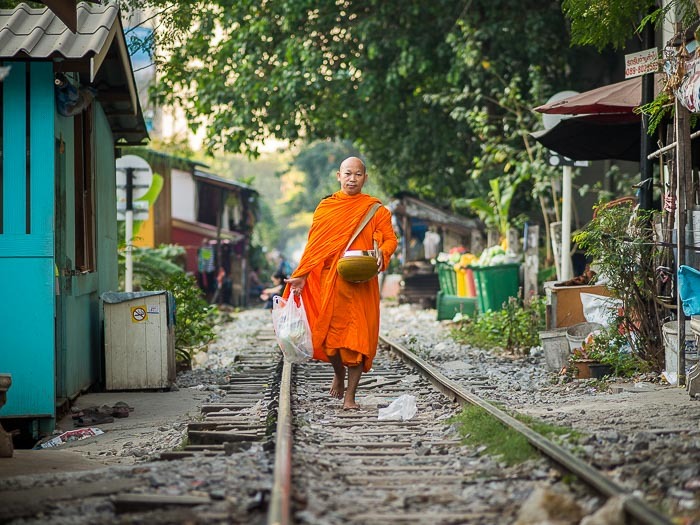 A monk on his morning alms rounds walks along the railroad tracks that run parallel to Sukhumvit Soi 1. I went out Wednesday morning for a walk along some railroad tracks in central Bangkok. The tracks run parallel to Soi 1. I crossed the tracks several times a day during our recent workshop with Bill Allard and I was curious about life along the tracks. People don't set up on the tracks here they way they do in Samut Songkram, but homes and shops line the tracks and people use the tracks as a sort of road into their neighborhood. I was walking down the line, photographing people going about their lives. I stopped to photograph a man working on a computer in his small shack and looked back up the line, towards where I had started and saw a monk on his alms rounds. 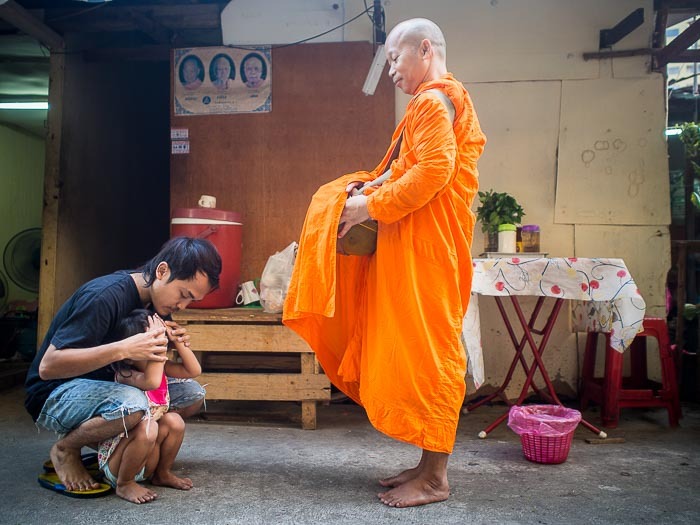 A family prays with a monk after presenting him with food during his alms rounds. 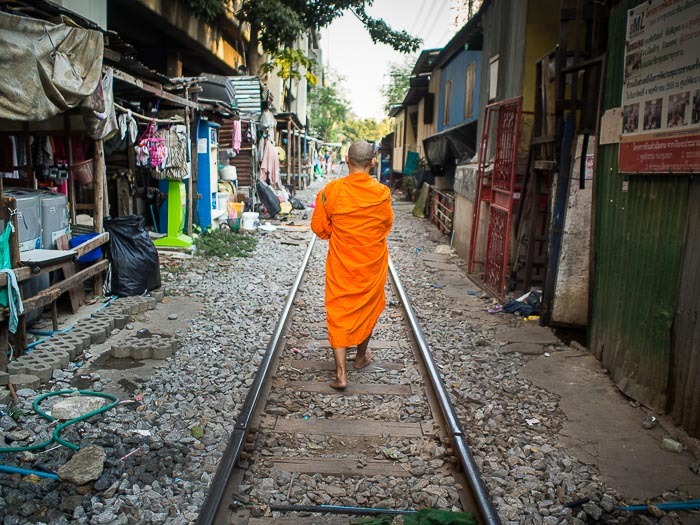 I put the 75mm lens on my E-P5 and made a couple of pictures but the monk was too far away and I started walking up the tracks towards the monk. He smiled at me as he passed and I fell in behind him as he walked down the tracks. 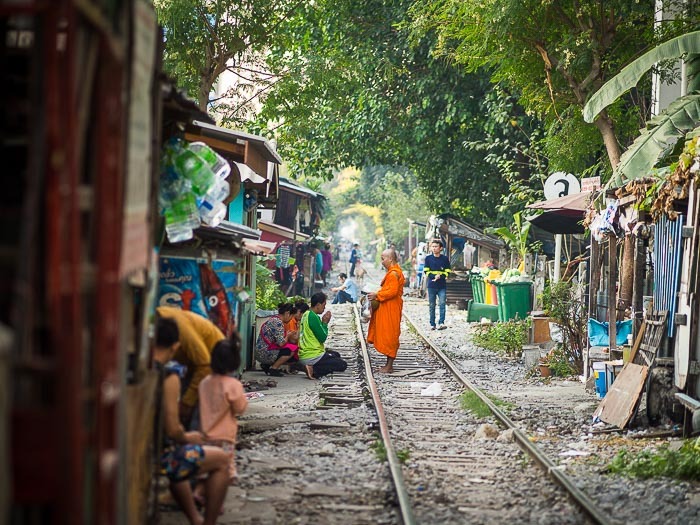 The monk collects alms from people who live along the tracks. I photographed him when he stopped at a couple of homes along the tracks. People waited along the tracks and gathered as the monk approached. They silently put their food or juice into his bowl and then bowed in front of him, hands clasped, while the monk chanted. Each stop took only a minute or two. I thanked each of the families after each stop then hurried to catch up to the monk. After the last stop, I thanked the monk and went back to photographing people on the tracks. The "reverse angle." One of my last pictures of the monk. 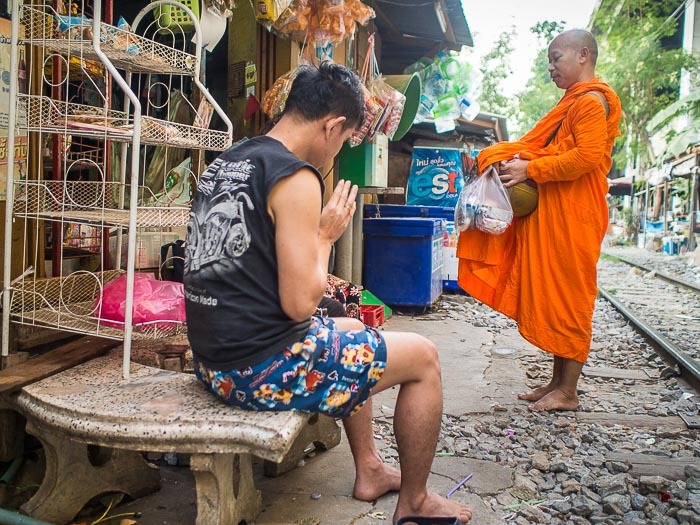 I did not set out Wednesday to photograph a monk on his alms rounds. The fairly monochromatic setting, the monk's robes clashing with the drab background, the soft morning light all combined to give me a great photographic gift.